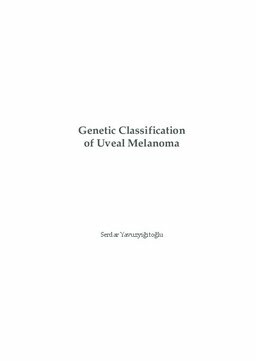 With the development of novel techniques for genetic analyses, the genetic basis of 1 uveal melanoma etiology has made a great progression. Next-generation sequencing led to the discovery of recurrent mutated genes such as BAP1, SF3B1 and EIF1AX. The aim of this thesis was to investigate whether compared to AJCC classification or GEP analysis, these genetic changes would provide a better prognostic tool to classify patients with UM in high-risk and low-risk groups. Sponsor The research project was initiated by the Department of Ophthalmology and Clinical Genetics, Erasmus Medical Centre Rotterdam, the Netherlands and The Rotterdam Eye Hospital, Rotterdam, The Netherlands. This project was financially supported by the Stichting Nederlands Oogheelkundig Onderzoek (SNOO), Combined Ophthalmic Research Rotterdam (CORR), Prof. dr. Henkes Foundation and the Bayer Ophthalmology Research Award 2016 (BORA).